Both of these teams are coming off blowout victories in the previous week — and as it happens, the final score of both games was 45-10. That seemed like an odd coincidence to me, so naturally, I wondered what kind of history there is for this kind of situation. It turns out that since the 1970 merger, there have been only four games in which both teams won their previous game by 35 or more points — the most recent in 1986. In 1972, the Dolphins beat the Jets 28-24 in Week 10. (That Miami team, of course, is the one that went undefeated through the Super Bowl that season). In 1973, the Falcons defeated the 49ers 17-3 in Week 7. In Week 9 of 1977, the Raiders beat the Oilers 34-29, and in 1986’s Week 5, the Bears blanked the Vikings 23-0. So in a very limited sample size, half of the games saw the teams put up a fair number of points in a one-score game, and in the rest of the games, one of them walloped the other. (I didn’t really expect to learn anything from this. It was just fun to look up. I love my job!). In this game, both defenses have just given up fewer points than any other game this season. And both offenses have just put up their biggest scores of the season. (It’s the Internet, so I know some wag is going to point out that the Chiefs offense only scored 38. OK, fine. The Broncos offense only scored 31. Feel better?). You could reasonably expect both units on both teams to come out swinging. And it’s a division game. The Chiefs are 6-5 against the Broncos since Andy Reid’s arrival. Reid lost five times in a row, and has now won six straight — but only three have been relatively easy victories. In each of the last two — both with Patrick Mahomes at quarterback — the Chiefs have had to come from behind to win. So don’t look for a blowout in this game. Look for it to be an incredibly physical battle that will be played to the final whistle. As a division rival, it’s easy for Chiefs fans to discount the Broncos. But it would be a mistake to discount the Broncos defense. The unit is, after all, the only one to hold the Chiefs to less than 30 points this season — albeit on their home field. 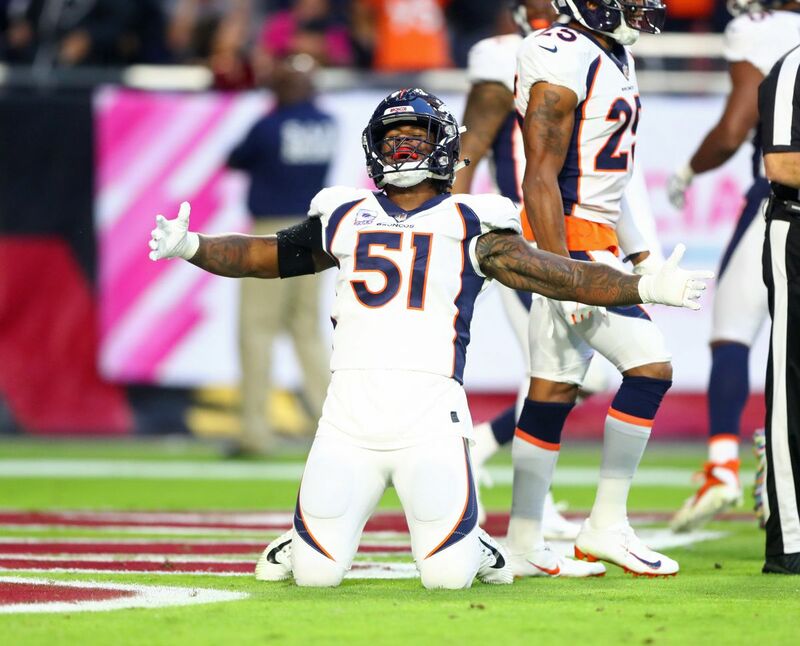 They no longer have some of the players that made them one of the NFL’s top defenses, but there are still some very talented players on the Broncos defensive roster. This week, Broncos safety Justin Simmons told Denver’s KDSP that Denver knows what it needs to do. Simmons told KDSP that he might be playing in the slot more against the Chiefs — something that Broncos head coach Vance Joseph seemed to be hinting in remarks about Simmons on Monday. Last week, I pointed out that the Chiefs were going to have to pressure Andy Dalton without blitzing him — because Dalton isn’t good under pressure, but is good at making defenses pay for blitzing. Apparently, Bob Sutton knew that, too. 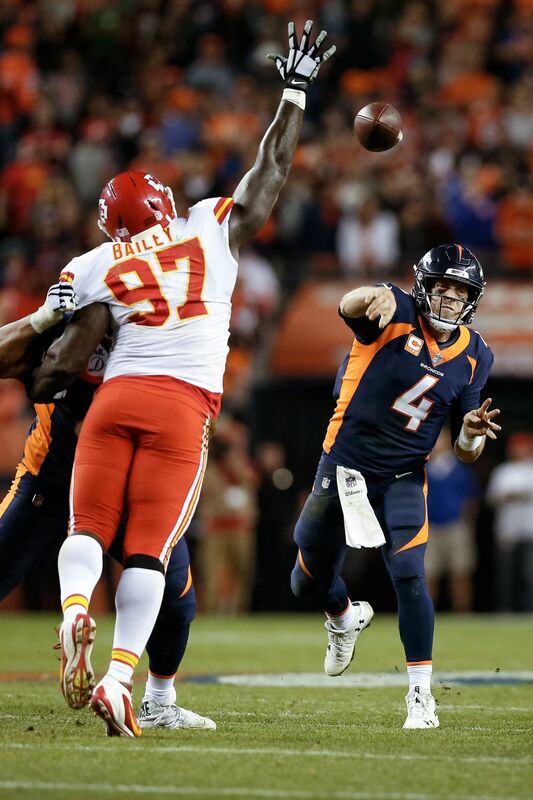 As Craig Stout pointed out in his analysis of the Chiefs defense against the Bengals, Sutton blitzed Dalton exactly once — but still got a pair of sacks, a quarterback hit and 11 pressures on 33 passing attempts. 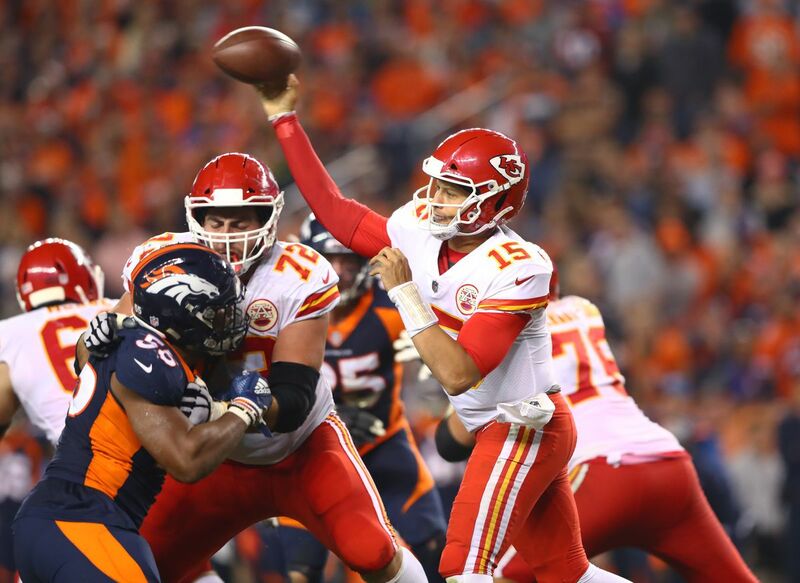 Dalton slinked away from Arrowhead with a passer rating of 63.6 on the day, and the Chiefs held a good offense to just 10 points. Case Keenum isn’t quite in the same league as Dalton, but pressure will disrupt him, and like any experienced NFL quarterback, he capable of making a blitz backfire. Sutton would be wise to adopt a similar approach this week. 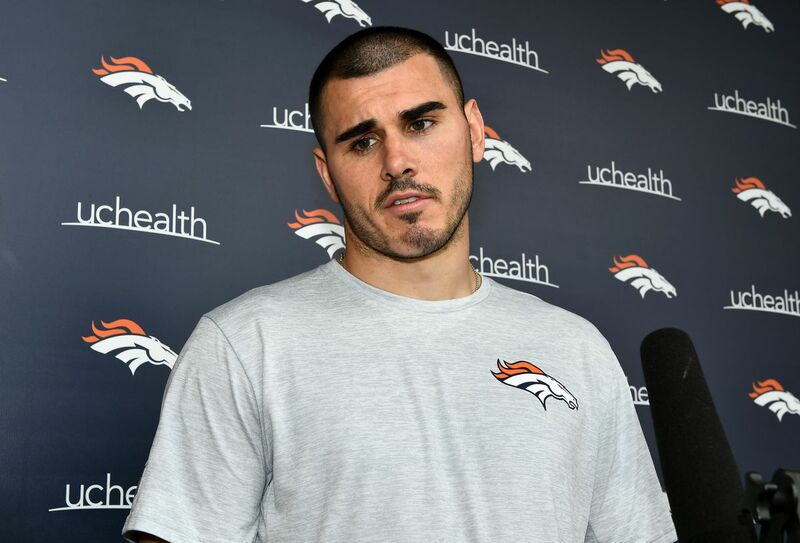 Since their backup quarterback Chad Kelly was arrested for criminal trespass in the early hours of Tuesday morning after attending teammate Von Miller’s annual Halloween party — and was subsequently cut by the team — it would be pretty easy to conclude that the Broncos are self-destructing from lack of leadership. And it’s possible that’s exactly what’s happening. But from long experience observing these kinds of incidents on NFL teams, I think it would be a mistake to assume that’s what’s going on. It’s not at all unknown for something like this to galvanize a team. It’s easy to imagine that Von Miller — embarrassed because this happened in connection with his party — to be doubly motivated to have a big game. It’s possible that Keenum — suddenly without a quarterback controversy swirling around him — could react in a similar way. In short, it’s impossible to predict what effect this incident will have on the Broncos. But it will be more than interesting to see how it plays out. 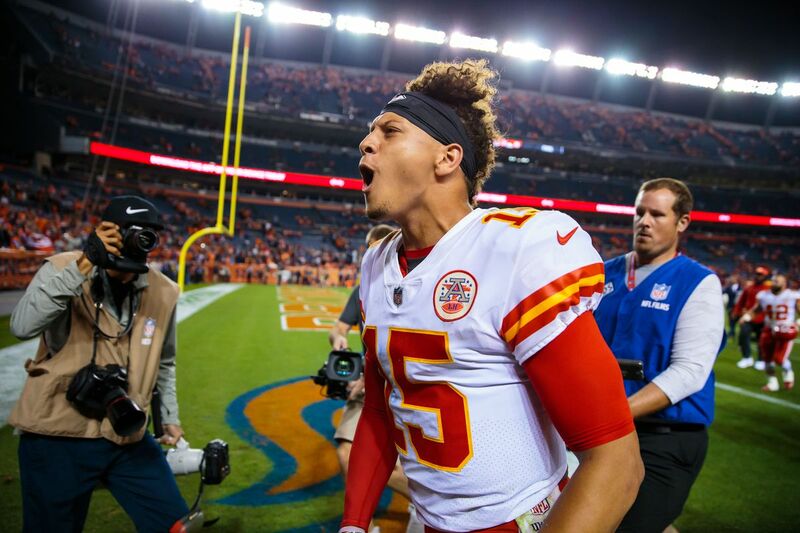 Patrick Mahomes has thrown 22 touchdown passes in the first seven games this season — a feat that only Peyton Manning and Tom Brady have accomplished. If he gets three more against the Broncos — can you believe we’re calmly discussing the possibility that a Chiefs quarterback could throw three touchdown passes in an upcoming game as if it’s something that happens all the time? — he’ll have 25 in eight games. Both Brady and Manning have done that, too — but it would exceed the number thrown in eight games by Andrew Luck, Drew Brees, Kurt Warner, Aaron Rodgers and Dan Marino. That’s some pretty hefty company. It’s also worth noting that if Mahomes makes it to 25 touchdown passes on Sunday, he’ll be the youngest player to throw that many through eight games of a season. Manning has done it twice — at 28 and 37 — and Brady didn’t do it until he was 30. Those three touchdown passes would also keep him ahead of Kurt Warner’s record for touchdown passes through nine career games — and in all probability, also push him above Warner’s passer rating of 116.1 through those games.